Ireland beat Bangladesh in the 2007 World Cup and, pitted against the same side in a must-win clash in more familiar conditions, produced an encore to surge into the second stage of the World Twenty20. This will go down as one of the biggest moments in Ireland's cricket history - but another disappointment for Bangladesh, who were knocked out of the competition. The hungrier side was always going to come up tops and Ireland took a massive stride by keeping a reckless Bangladesh to 137. Bangladesh batted with the freedom of a team that believed they were already in the next stage and paid the price, stumbling after a shaky start. Mashrafe Mortaza's late heroics ensured at least a fighting total, which is where some self-discipline could have changed the outcome of this game. Ireland applied themselves to their chase and got home by six wickets - the O'Brien brothers again proving their worth - to yells and whoops from their dugout. Twenty20 isn't a format where you can check in and book yourself for bed and breakfast but there still is a need for stability. Instead Bangladesh started like a runaway train, scoring 30 of their first 39 runs in boundaries, despite losing a wicket early. Three boundaries in five balls are plenty, but Junaid Siddique took a silly dance down the track and started the rot. Mohammad Ashraful briefly threatened to make Ireland pay for a drop at first slip, pulling - a la Gordon Greenidge - over deep square leg and hitting Boyd Rankin over mid-on for sixes in one over, but then again steered to slip where Kevin O'Brien atoned for his earlier lapse. Predictably, William Porterfield turned to spin as the fielding restrictions were lifted and immediately Bangladesh tried to dominate, unsuccessfully. Johnston picked up the third as Shakib Al Hasan picked out long-on, before tidy spin from both ends and a sudden spring in Ireland's step further confounded Bangladesh. Tamim Iqbal paid the price for misjudging a single, caught inches short - and with his foot in the air after he dropped his bat - by a smart pick-and-throw from Niall O'Brien. Niall was in action minutes later, brilliantly stumping Mahmudullah, his foot an inch off the ground as he heaved, when standing up to Alex Cusack's medium-pace. Consolidation was the need of the hour but instead of taking a couple overs to consolidate, Mahmudullah swung recklessly across the line. 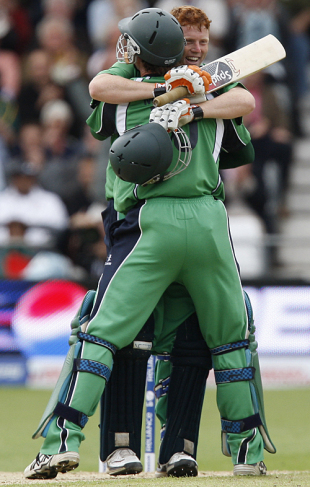 The buzz around Ireland was stirring, the fielding now top-notch, and you could sense an upset. This was a time for Bangladesh to take a step back. Instead they kept swinging, clearly fraught at not having managed a boundary for 71 deliveries - a result of excellent work from Johnston and Ireland's spinner. West and Kyle McCallan plugged way splendidly, tidy with their lines, and accounted for Mushfiqur Rahim and Raqibul Hasan. Ireland had crawled all over Bangladesh, strangling runs and keeping the batsmen guessing as to where the next run would come from. McCallan returned exemplary figures of 4-0-17-1, but there was a bit of gas in Bangladesh's tank still. Mortaza's lusty hitting earned him two sixes in the final over, a handy cameo. Mortaza then struck with the ball to dismiss Jeremy Bray in the third over Ireland's openers started watchfully, aware that a daredevil approach could harm them. Then Niall stuck it to Mortaza, flicking three sixes with immense power in the sixth over, and taking a pair of boundaries in Mahmudullah's first over. Niall played off the back-foot with power, but a late cut off Naeem Islam's first ball showed he could perforate the gaps with grace too. Irish supporters in the crowd cheered raucously, aware that what their team was doing was stunning. However, Porterfield's sluggish approach forced Niall to improvise and he fell for 40 from 25 balls. Ireland were on track with the asking rate when Porterfield chipped a return catch to Adbur Razzak, and a similarly soft dismissal from Gary Wilson, driving the first ball of Mortaza's second spell to extra cover, sent Bangladesh into raptures. Ireland still needed 49 from 34 but Kevin shut the door with some clutch hits, flicking a full toss from Mortaza to fine leg, dumping Razzak over midwicket and creaming Rubel Hossain over and past extra cover twice. John Mooney wasn't to be left behind, reverse-sweeping a four to ease the pressure, but it was Kevin who had the final word, clubbing another effortless six and sealing victory with a four off extra cover. "I will be very disappointed if we don't make our mark in this competition," said Ireland coach Phil Simmons on the eve of this match. In their first game against a professional side in this format, Ireland did make their mark. And how.